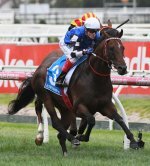 The Cryptohorse Racehorse Database lists every thoroughbred horse which has raced in Australia and New Zealand since 2000. As the majority of these horses are now retired the current owners are invited to search for their horse and submit a claim to become its owner on Cryptohorse. In order to submit a claim you will need to be a registered member of Cryptohorse. Registration is free. You will need to upload photos to your listing to have your claim recognised in order to confirm that you have the horse in your possession. Once you have the horse in your Cryptohorse stable you will be able to use our social media section to tell the world what you and your horse are up to. You will also be able to activate your horse's Feed Bin which will enable your horse to raise funds to help you to better look after it.